Made in North Carolina USA, this awesome Trumpet Valance features a fully lined back with a luxurious face of paisley blue tones on a winter white ground. Covered buttons in light blue is set on a matching winter white tab which overlays the decorative rod. Five buttons and four scoops per swag. Three inch loops can support up to a 1 3/3 inch decorative rod. The Almost Custom collection by Athena from The Curtain Shop gives you total freedom to create the beautiful home of your dreams. Choose from dozens of floral, geometric, patterned and solid-colored fabrics. Then, decide whether you'd like to have it crafted into valances, drapes or curtains, pillows or a shower curtain. With a large variety of styles available for each option, you're sure to find the perfect cut for your space. Already have a specific vision for your curtains or throw pillows that isn't available through Almost Custom? Take the custom aspect a step further and order Athena fabric by the yard for your own unique creation. Fabrics by the yard are 54 inches wide and priced per yard with a two yard minimum. Order a 10-inch by 11-inch swatch today to test how these gorgeous fabrics fit into your home décor. It doesn't matter whether you choose to have a product custom created for you or you choose to take matters into your own hands with fabric by the yard. You'll be sure to have stunning new curtains, drapes, valances, pillows or shower curtains made with gorgeous, high-quality Athena fabric from The Curtain Shop. The two piece Corded Swag is versatile enough to suit any contemporary or traditional d�cor scheme, and is our most popular valance style. It is offered in four sizes measuring 100 inches wide in your choice of 34", 42" 48" or 66" long on sides. Each size has a 16 inch long center. Use Corded Filler Valances to accommodate wider windows. The Corded Swag features a 3-inch rod pocket, 2-inch header and the self cording along the bottom edge makes this window topper look stunning. It's fully lined with white high quality Luster Sateen lining, the best quality in the industry. You will love the meticulous workmanship and fabric quality we put into making the best to be found anywhere, and made in the USA. Use a 2 1/2 inch continental rod for hanging. Allow a two to two and one half times the width of your curtain rod for proper fullness. Cozumel, with its a tropical allure, features subtle tones of green and orange on an ivory ground. The 2 piece Gigi Swag measures 100 inches." wide and 26 inches long. It has a scalloped bottom edge adorned with cording and is fully lined, with a 3 inch rod pocket and two inch header. Allow two times your rod width for proper fullness. Use the Gigi Filler Valances to accommodate wider windows. The Filler Valance fit perfectly between the two swag sides. Use a 2 1/2 inch continental rod for hanging. Made in the U.S. of Cotton Duck. 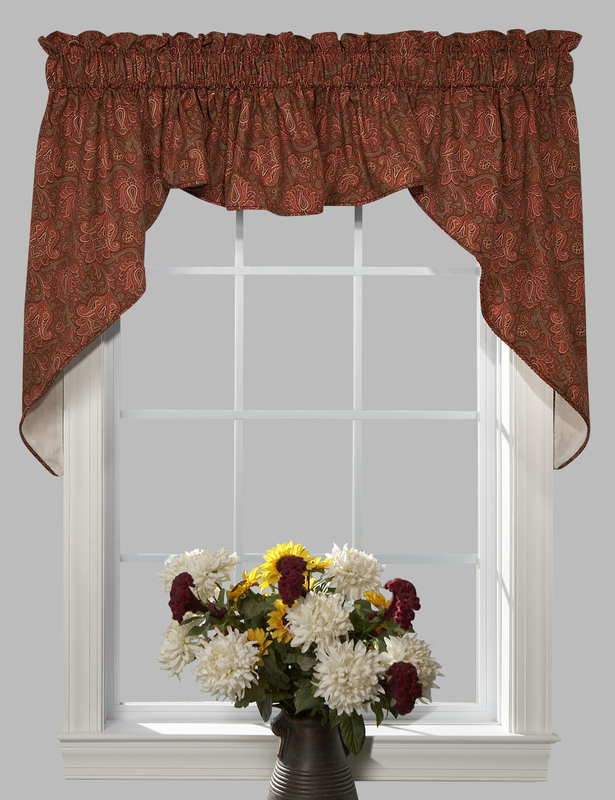 The Thomasville Suzette Empress two-piece swag valance is a classy and elegant solution for bare windows in your home. It has a scalloped bottom edge adorned with self-cording and is fully lined. A slight ruffle at the top creates a pleasing aesthetic. The floral swirl pattern is both modern and traditional, and the subtle yellow, green and blue colors allow it to fit perfectly with any room décor. 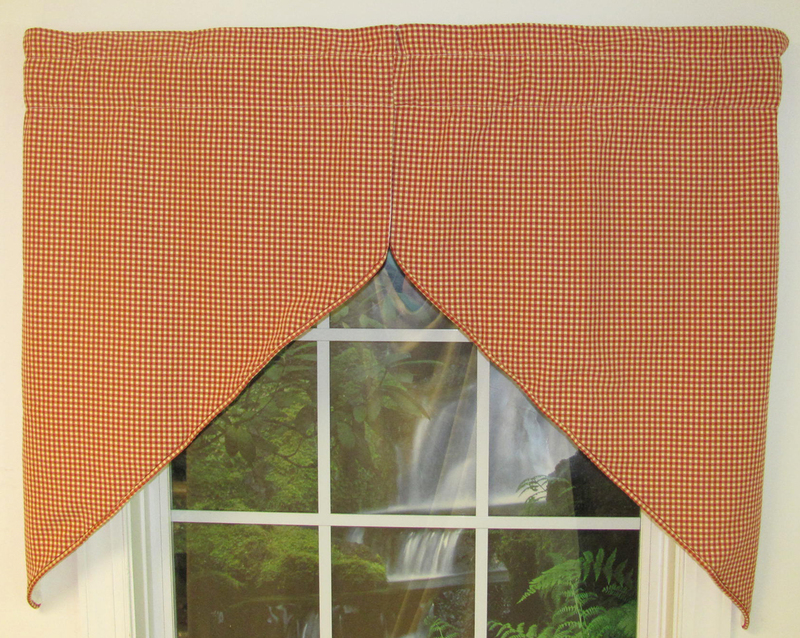 The Suzette valance measures 100 inches wide by 30 inch long sides and has a 16-inch center. Allow two times your rod width to ensure the proper curtain fullness. The Empress Filler Valances are available to accommodate wider windows. The Filler Valance fits perfectly between the two swag sides. Use a 2 ½-inch continental rod for hanging this curtain in any room. 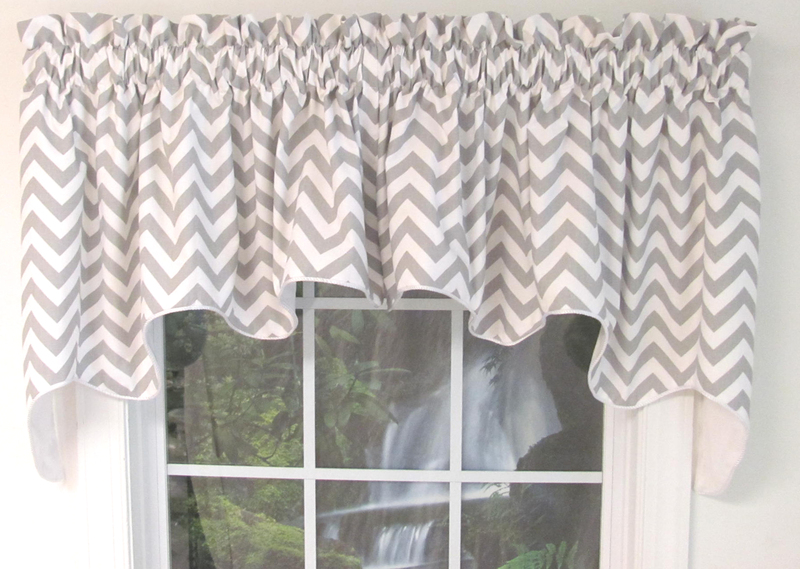 The Reston Duchess valance will brighten up any room with its chevron pattern in your choice of bright or neutral colors on white from The Curtain Shop. The 3/4-inch horizontal zigzag stripes on our fully lined Duchess scalloped window valances are available in six colors. Choose pink, lime green, spa, sterling, turquoise or black. This U.S.-made valance crafted of 100 percent premium cotton is an eye-catching way to dress up your windows. The width is 100 inches. The length is 17 inches at the center and 30 inches at the sides. This window topper has a 2-inch header and 3-inch curtain rod pocket. The Ankara Karaman Lexington Valance is substantial and bold yet unobtrusive. Its Turkish-inspired design is reminiscent of royal patterns and fabrics from a gilded age. Its triangular shape is thoughtfully softened by the plush tassels and curling floral design, with the bottom zig-zags adding interest and detail. Outfit a stately living room or bring a dignified touch to global-inspired d�cor anywhere in your home. Made in the U.S., the elegant Regal Valance hangs so beautifully, it looks like an "on the board" window treatment costing hundreds of dollars. The main fabric, Lily Yellow, is a pretty floral design of pink tones, gold tones with greens to make this attractive color pallet, accented with Lon Jupiter Dandelion inside the pleats and bells. The standard Regal Valance fits a rod width between 39" and 48". It is a seven piece set including two Swoops 15"W x 15 1/2"L, three Bells 5"W x 15"L, and a pair of Jabots pleated to 6" wide and 36" L. For wider curtain rods, add an additional Swoop and Bell sold together as a set. It is so easy to install this stunning window treatment despite its complicated appearance. All you need is a double one inch standard rod. The jabots and all swoops are mounted on the outside rod. The three bells are mounted on the inside rod, then flip over top of both rods. Jabots and Bells are contrast lined. Rod pockets are 1 1/2" and requires a double 1" standard curtain rod. A bold black pattern of daisies and stems on a white background defines this chic two-piece Posey curtain swag from The Curtain Shop. The 16-inch length at the center cascades to a 39-inch length at the sides of this Posey swag in a 100-inch width. 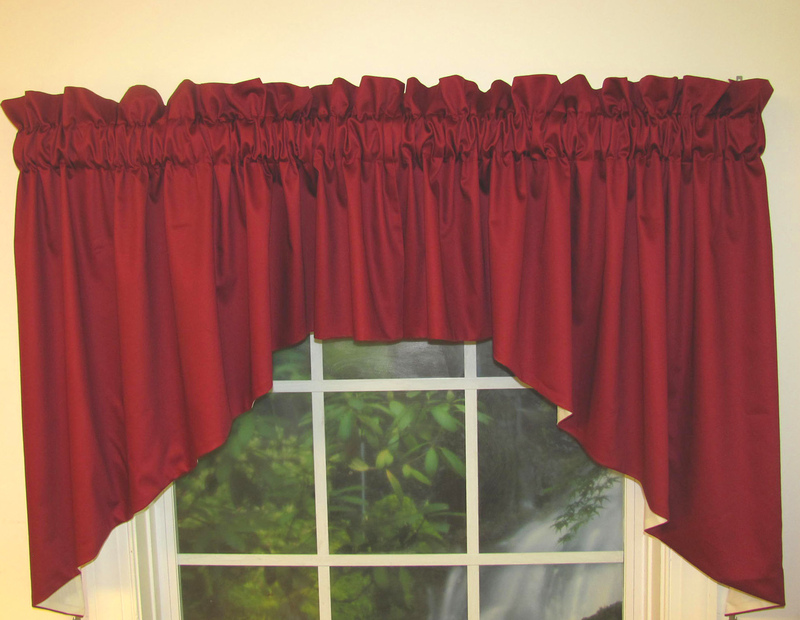 It's a fully lined U.S.-made curtain with a 3-inch rod pocket and 2-inch header. The corners are weighted for a beautiful drape. The two-piece window topper splits at the center to accommodate optional swag inserts for wider windows. 3" rod Pocket, 2" header, fully lined. Scalloped bottom edge is self corded. Fits a standard single window. Use Scallop Valances between the two pieces to accommodate wider windows. This checked and striped Empress valance from Ellis Curtains comes in refreshing seafoam and watermelon color options. It features a three-inch rod pocket and two-inch header. Measuring 70 inches wide by 28 inches long (15 inches in the center), it fits a standard single window and can be paired with a Scallop valance for wider windows. 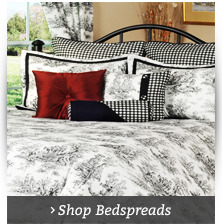 This Charlestown Check Empress valance is made in the U.S. with 100 percent cotton. Dry clean only. Made in the USA, the Mateo Stripe Duchess valance comes in black, basil, pink or brown color palettes. This versatile two-piece set is fully lined and includes a two-inch header and three-inch rod pocket. The bottom edge is corded and scalloped. Mateo Stripe Duchess Valance, which measures 100 inches wide by 30 inches long, goes with most any decor in any room in your home. Made by Ellis Curtains with 100 percent cotton (dry clean recommended). Fullness of 2:1 to 2.5:1 is recommended. Pair with Duchess inserts for wider windows. Dimensions: 100" wide x 30" deep. Allow fullness to be between 2 to 1 and 2 1/2 to 1 times the width of your rod. Made in the USA by Ellis Curtain Co. This Regency Duchess valance by Ellis Curtains is an Imperial Dress pattern medium-scale Jacobean floral print window topper with a scalloped border at the bottom. Choose yours in a soft blue or antique shade from The Curtain Shop. The generous 100-inch width and 2-inch header on this fully lined American-made valance is designed to produce a beautifully gathered look. The fabric is 100 percent cotton. The 3-inch pocket rod will fit a 2 1/2-inch diameter continental curtain rod. The length is 15 inches at the center and 30 inches at the sides. 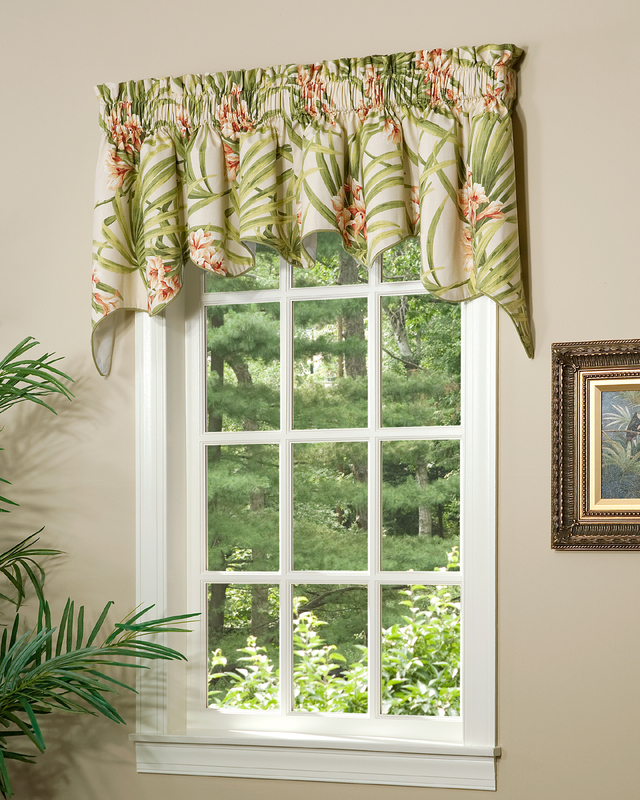 The Tree Blossom Natural Regal valance has flowy swoops and bells, which creates an elegant window dressing. The fabric features a soft floral pattern in neutral colors, which can accentuate any room color. This curtain fits a rod width between 39 and 45 inches long. It comes as a seven piece set and includes two swoops which measure 15 inches wide by 15 ½ inches long, three bells that measure 5 inches wide by 15 inches long and a pair of jabots which are pleated to 6 inches wide and 36 inches long. For wider curtain rods, add an additional swoop and bell, which are sold together as a set. To install this stunning window treatment, use a double 1 inch standard rod. The jabots and swoops should be mounted on the outside rod, while the three bells are mounted on the inside rod and then flipped over the top of both rods to finish the look. Visit our Olde Towne program and discover hundreds of fabrics this window topper is available in. 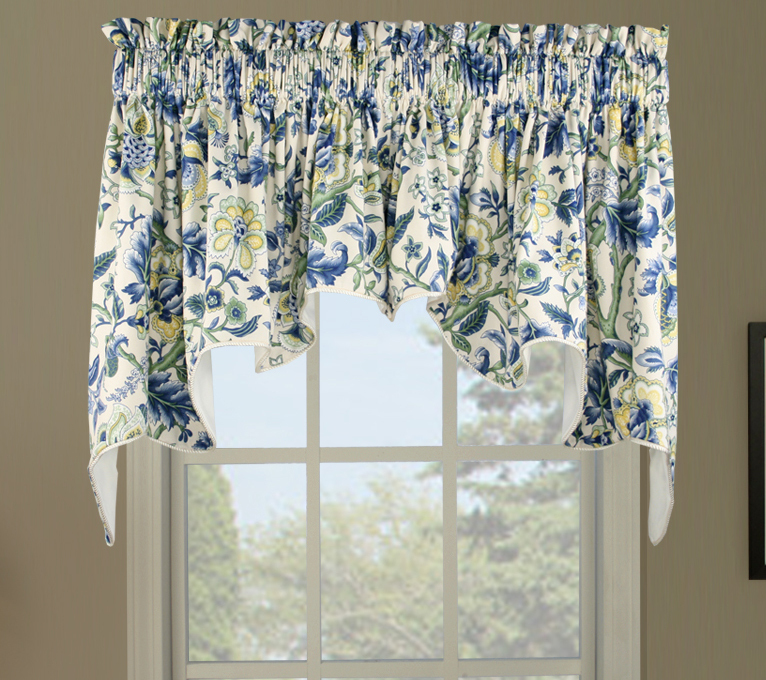 Lush colors define this Jacobean floral print two-piece Imperial Dress window valance by Ellis Curtains. Order this elegantly designed scalloped and corded valance with a rich red, black or subtle gray background from The Curtain Shop. This swag valance is its own window topper in a 100-inch width and 30-inch length that narrows to 15 inches at the center. It's a fully lined 100 percent premium cotton window topper with a 3-inch rod pocket. The 2-inch header creates a ruffled look above. Looking for a pretty Jacobean fabric to add to your space? 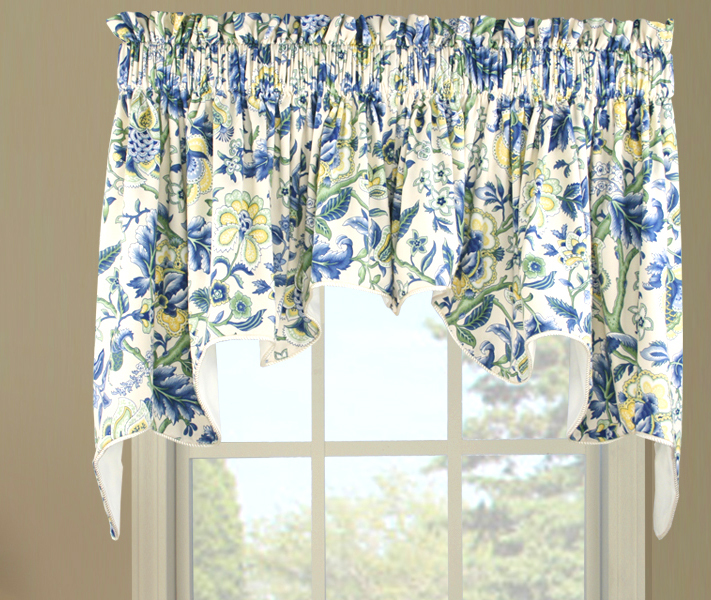 Get the Floral Vine Sapphire insert valance with its bold green and blue tones on a cream background. This valance measures 50 inches wide by 15 inches long and includes a two-inch header and three-inch rod pocket, making it ideal for use with a 2 �-inch continental rod. This American-made, fully lined valance can be combined with the three-piece swag or additional inserts for wider windows. Made in the USA. 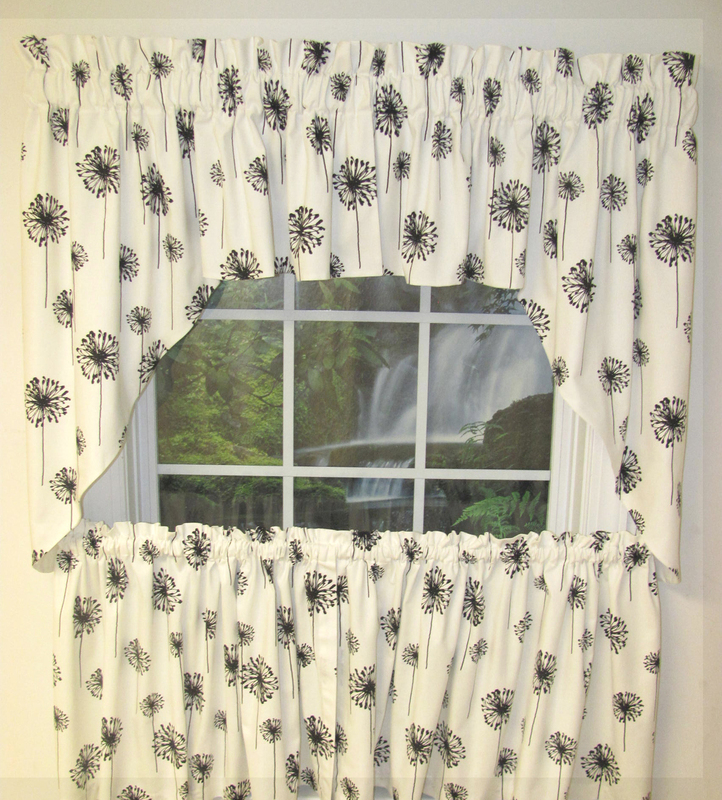 The Insert Valance has is fully lined in off white lining material, has a 3" rod pocket and 2" header. Use this window topper along with the 3 piece Swag or it looks great on its own. Add additional Inserts to accommodate wider windows. These stunning Portifino hydrangea window valances are available in two shades from The Curtain Shop. They drape beautifully and have coordinating woven patterns on the front and back. 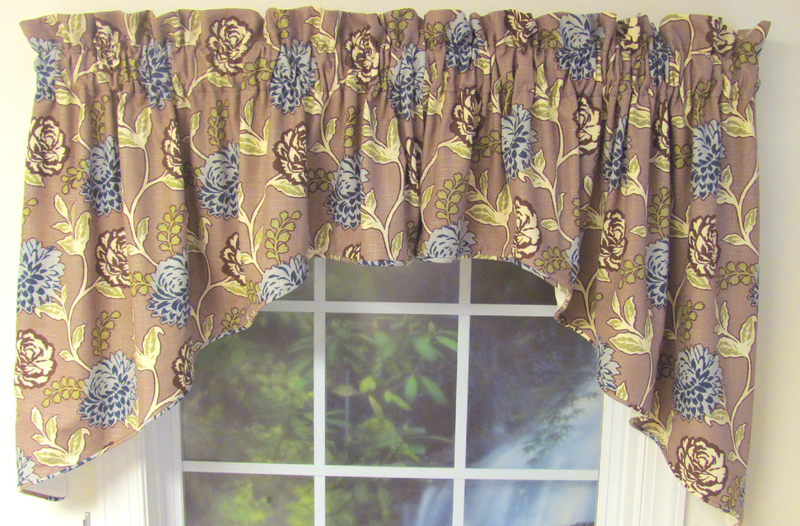 The hydrangea cocoa valance is brown and taupe with aqua accents on the flowers and leaf veins on one side. The other side has aqua and brown floral and leaf accents. The hydrangea bronze valance is gold, antique gold and rust with a gold leaf pattern woven into the Portifino fabric. The reverse side is rust with an antique gold leafy pattern. This is a no-header window topper designed to lay flat. The width is 48 inches, and the length is 33 inches from the top of the 3-inch curtain rod pocket. 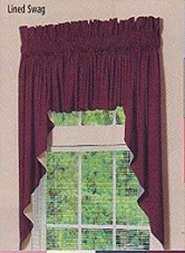 PHOTO ILLUSTRATES A TWO PIECE SWAG WITH AN INSERT VALANCE IN CENTER. INSERTS ARE SOLD SEPARATELY. 2 Piece Swag Valance measures 50" wide and 24" long. 24" wide each side. 3" rod pocket, 1-1/2" header. Use a 2-1/2" continental rod or decorative rod for hanging. Fully lined. Fits a 25 - 30" single window without the insert valance. Photo illustration was taken on a 41" wide window with one Insert Valance fitting up to 52" wide. Photo illustrates the 2 piece swag plus one insert in Beige. Choose from four colors (beige, blue, onyx or mocha) for this elegant Bailey two-piece swag with a self-corded bottom edge. The set includes two pieces measuring 24 by 24 inches. A three-inch rod pocket (for use with a 2 �-inch continental rod) and 1 �-inch header are included. This American-made swag set is fully lined and fits a 25- to 30-inch single window - insert valances are available for wider windows. Made from 100 percent cotton and machine-washable (gentle cycle cold, tumble dry low). 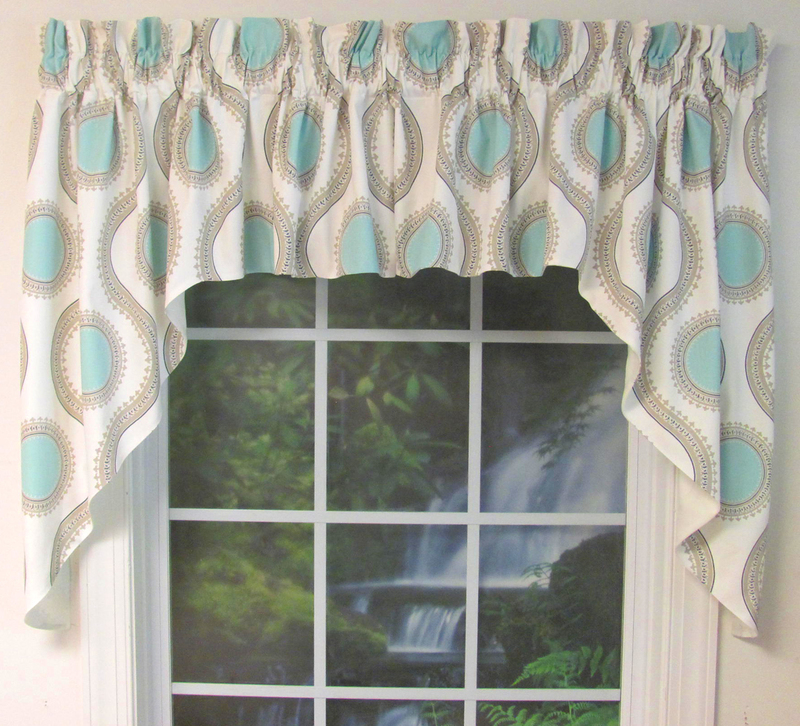 Photo shows a Two Scoop Celebration Valance in Fontina Ivory, a beautiful floral embroidery patter of Ivory, Aqua, and Taupe on an ivory ground and embellished with matching fringe along bottom edge. TASSEL TIES ARE NOT INCLUDED. TASSELS MAY BE ORDERED SEPARATELY. * Two Scoops fit up to a standard single window 30 to 40" wide. Photo taken on a 40" wide window. Fabric is 100% Polyester, trim is 100% Rayon. Dimensions: 70"W x 28"L (center is 15"
These Tyvek Empress curtain swags feature a scalloped bottom edge that is self-corded. 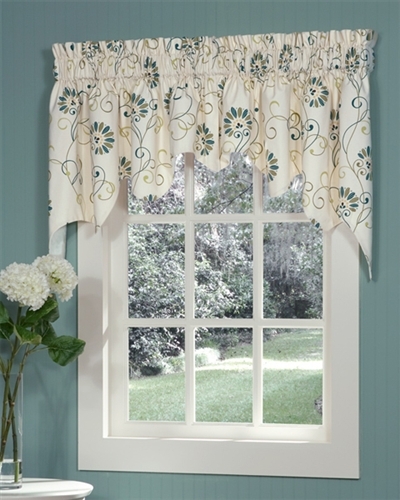 At 70 inches wide by 28 inches long (15 inches in the center), it fits a standard-sized single window, though scalloped valance inserts are available to accommodate wider windows. This fully lined Empress swag has a three-inch rod pocket and two-inch header. Made in the U.S. by Ellis Curtains, the Tyvek Empress swag is 100 percent cotton and dry clean only. With its sharp looking scalloped bottom edge, this self-corded Tremblay Empress swag valance has a stylish look you'll love. It is made in the U.S. with 100 percent cotton, and measures 70 inches wide by 28 inches long (15 inches in the center). It features a three-inch rod pocket and two-inch header. The Tremblay Empress swag is fully lined and split in the center. Pair it with the Scallop Valance for wider windows. Dry clean only. Made of 100% Cotton, dry clean only. This Duchess Omaha window valance in sage is available in a 100-inch width from The Curtain Shop. 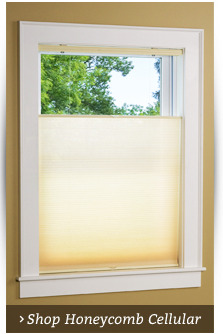 The length is 30 inches on this lovely window treatment in 100 percent premium cotton. The fully lined two-piece Duchess valance separates at the middle to accommodate wider windows with the use of a Duchess insert valance. 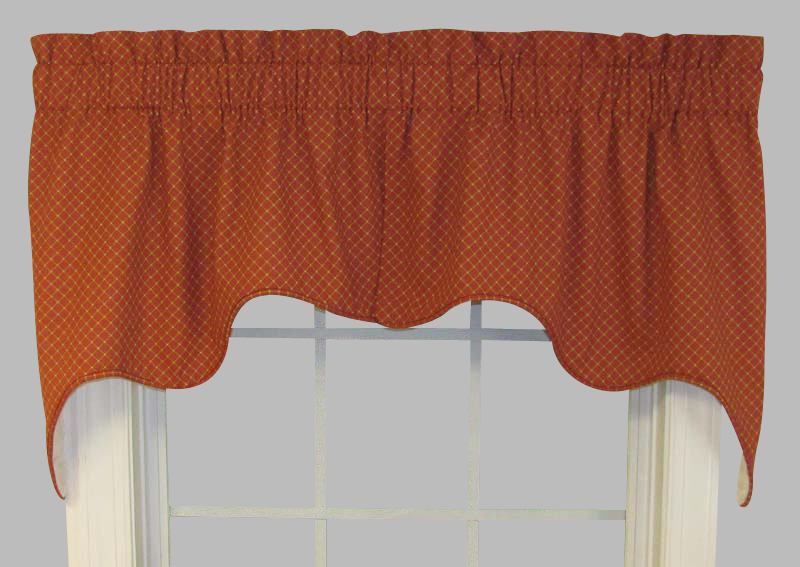 Rope cording trims the scalloped bottom edge of this valance-style curtain by Ellis Curtains with a 3-inch rod pocket and 2-in. header. It's machine washable, too. Duchess valance is split in center so Duchess Insert Valances may be added to accommodate wider windows. 3" rod pocket, 2" header, fully lined. Accented with rope cording along scalloped bottom edge. Omaha is a attractive small scale onion pattern made of 100% Cotton and machine washable. Photo illustrates Duchess Valance in black. 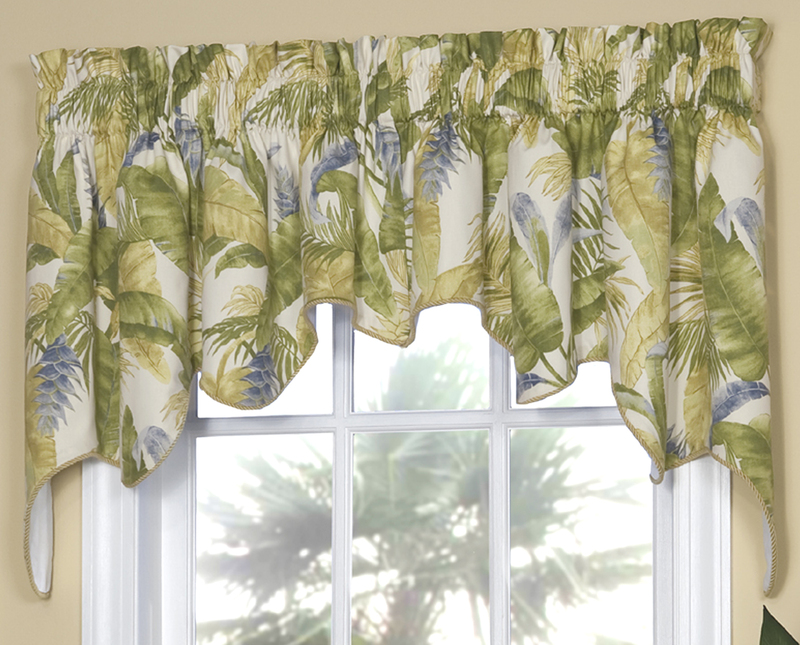 Choose a black or vanilla background for the tropical design fabric of this Duchess La Selva window valance by Ellis Curtains. 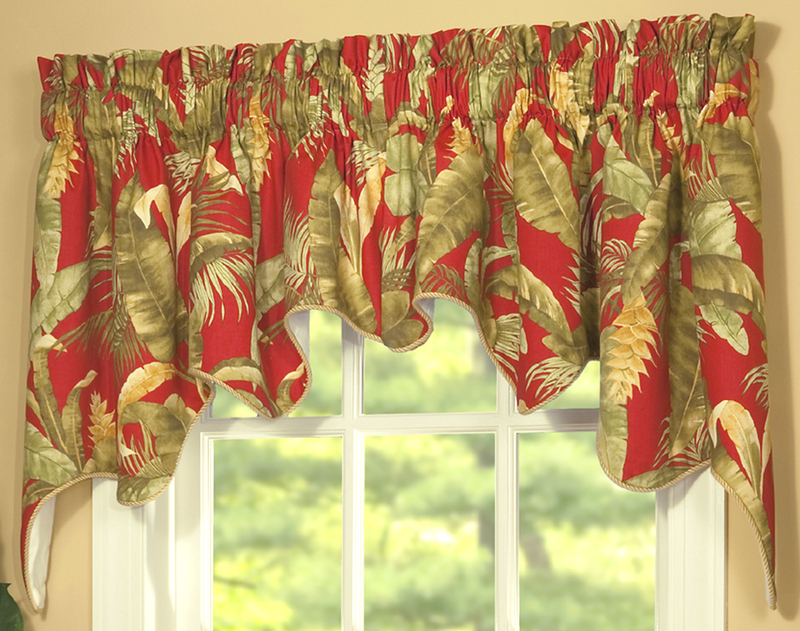 These fully lined 100 percent cotton valances now on sale at The Curtain Shop will add a hint of the tropics to any room. 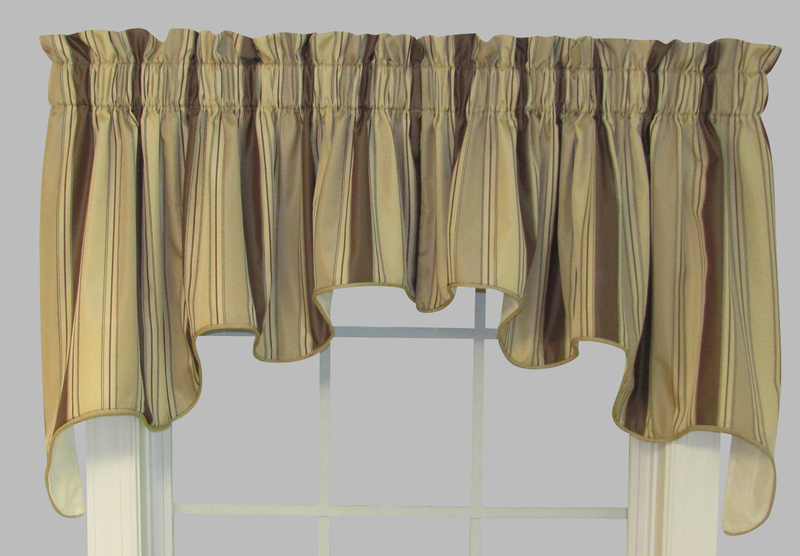 The valance border is scalloped and trimmed with twisted rope cording. 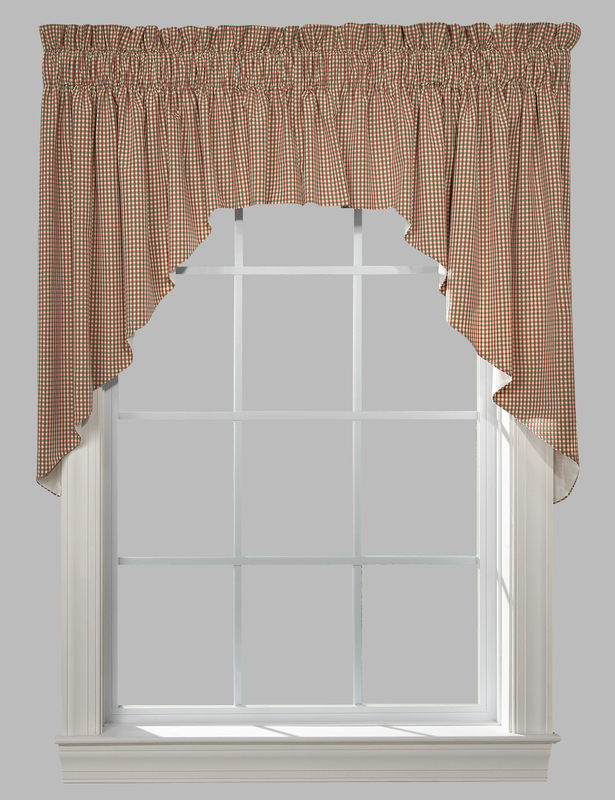 The two-piece valance splits at the center to allow the optional use of an insert valance for non-standard window sizes. The lining fabric is solid off-white, and the dimensions are 100 inches by 30 inches. Made in the USA, dry clean recommended. 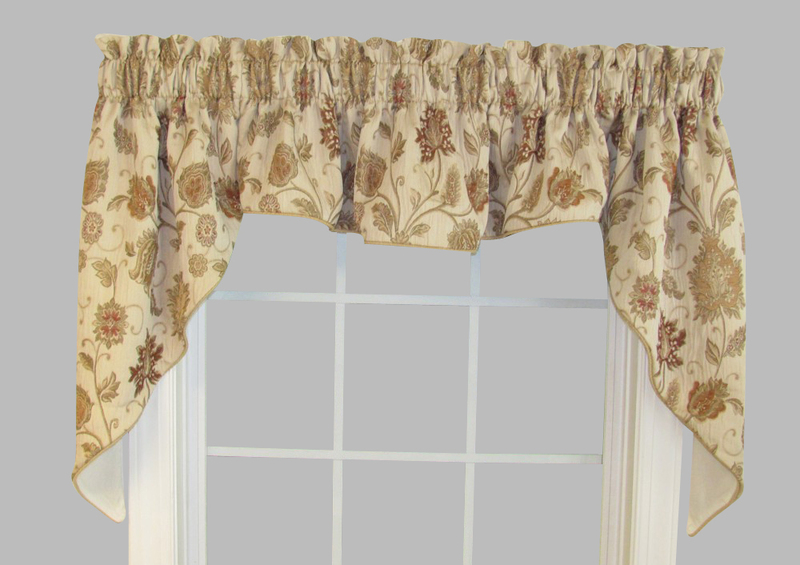 The Barano Duchess window valance by Ellis Curtains has a beautiful Jacobean floral design with scalloped borders and twisted rope corded trim. 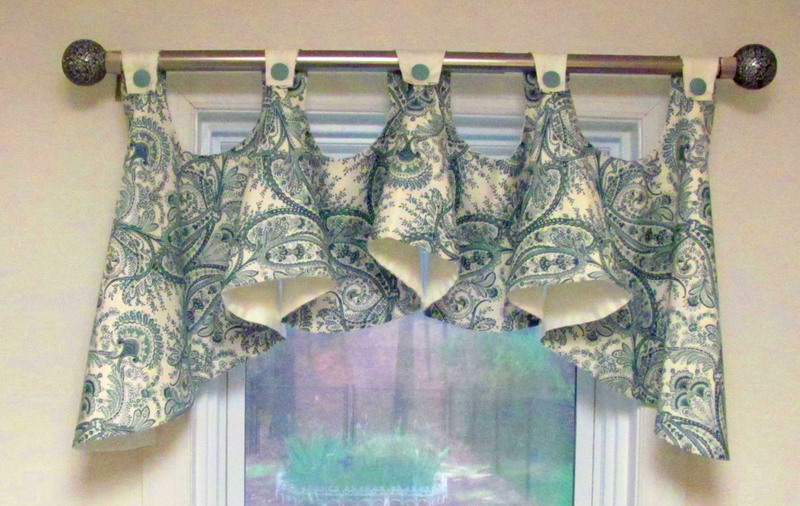 This Duchess two-piece valance in 100 percent cotton is available in navy, green, brown and Wedgewood blue at The Curtain Shop. The total width is 100 inches to fit a standard single window. Place a matching insert valance at the center to accommodate larger windows. The length is 15 inches, and the 2-inch header creates a ruffled top. Dimensions: 100"W x 30"L x 15"L fits a standard single window. This designer floral Duchess valance in 100 percent linen is available with a blue or linen background from The Curtain Shop. The Duchess Denehy window valance by Ellis Curtains has a beautifully scalloped border with twisted rope cording that will add a custom-look window treatment to any room. 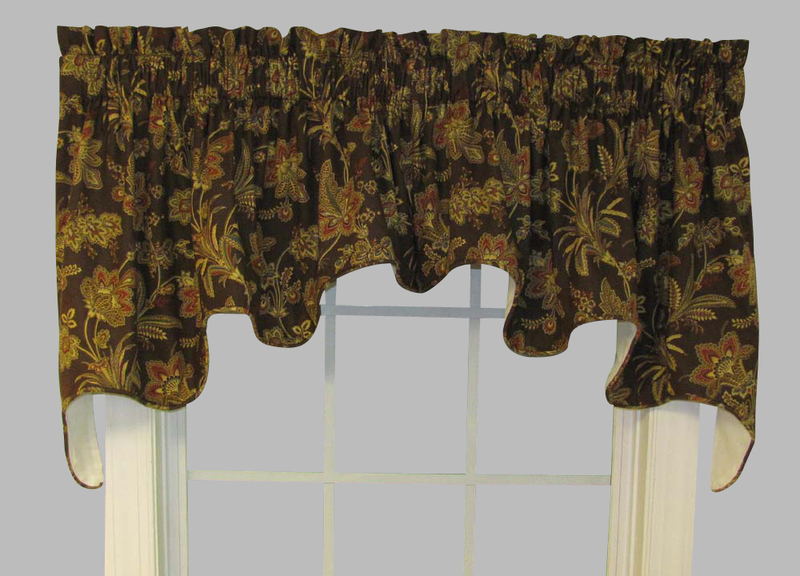 It's a two-piece valance that can accommodate an insert valance for larger windows. The width is 100 inches to easily accommodate a standard window size. The length is 30 inches. We recommend the use of a 2.5-inch diameter continental rod to hang using the 3-inch curtain rod pocket. The 2-inch header creates elegant ruffling at the top. 3" rod pocket, 2" header, split in center, fully lined. Use a 2.5" continental rod for hanging. The Sea Glass full-bodied swag curtains offer a semi-sheer, softly textured option for your home. Choose from four colors (white, ivory, blue or pink) and four length options (24, 54, 63 or 72 inches). Each 62-inch-wide swag features a 1 �-inch rod pocket and header for use with a standard one-inch rod. These 100 percent polyester drapes are machine-washable (cold, gentle cycle) and can be tumble dried on low. Warm iron for touch ups. Photo illustrates two pair of swags in blue; one pair of 63" length and one pair of 24" length inverted to form an attractive shaped center. The flounce valance may also be used in multiples to accommodate wider windows. 1 1/2" rod pocket and header. Made of 100% Polyester. Imported. Machine wash cold water on gentle cycle. Tumble dry on low. Warm iron touch up as needed. 2" header, 3" rod pocket and 1/2" side hems. Use Insert Valances with the 3 piece Swag Set to accommodate wider windows. QUANTITIES ARE LIMITED. Dimensions: 100 x 36 Fits a standard single window. Use Insert Valances with the 3 piece Swag Set to accomodate wider windows. Quantities are limited. Clearance items are not returnable. Fully lined, 3" rod pocket, 2" header. Not availalbe in Blue. This three-piece set measures 84 inches wide with 63-inch sides and a 12-inch center. Imported from India by Ricardo Trading, the Sachet swags come with a 1 �-inch rod pocket for use with a standard one-inch rod. Each set includes one pair of swags and one insert valance, with additional inserts available for wider windows. These 100 percent cotton swags can be machine-washed cold on the gentle cycle and tumble dried on low, with iron touchups as needed. The Climbing Roses country kitchen curtain red fabric accented with a floral print This three-piece swag set is available in 38 inch length only (photo illustrates 63" length), with inserts available to accommodate wider windows. Coordinating green and red plaid tier curtains are also available. This 100 percent cotton set can be machine-washed in cold water on gentle, then tumble dried on low. Cool iron for touch ups. Fits a standard single window. Use additional Swag Inserts to accommodate wider windows. The Waverly Garden Duchess valance features a large-scale floral print on a woven jacquard fabric in sage or black. 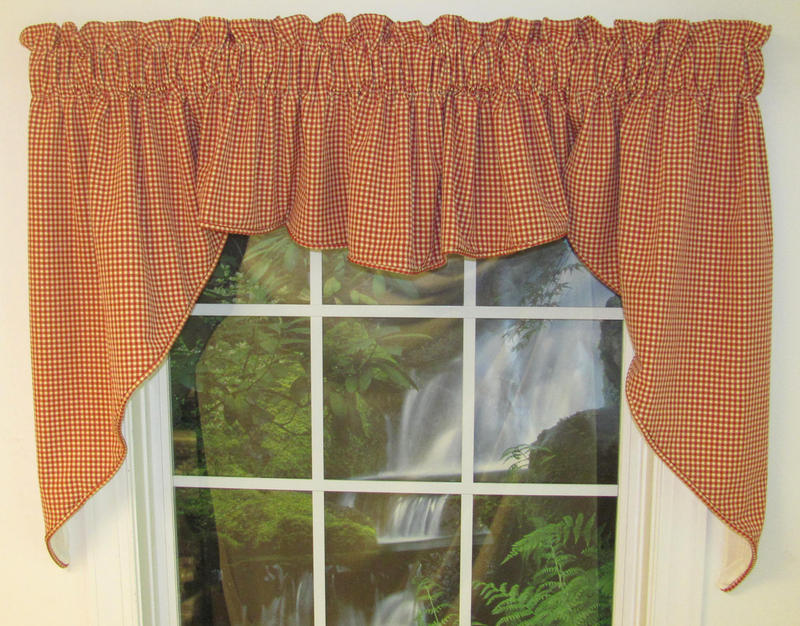 Made in the U.S., this 100 percent cotton, fully lined valance fits a standard single window at 100 inches wide (30 inches long on the sides and 15 inches long in the center) with a three-inch rod pocket and two-inch header. Self-cording is included on the bottom scalloped edge. Allow a 2:1 to 2.5:1 ratio of fullness and use a 2 �-inch continental rod. Dry clean only. Beautiful and versatile and styled to frame your window perfectly. Swag is cut on the bias to provide maximum fullness, and is split in center to add a Valance (not included) when desired. This luxurious fabric blends with any decor and can be used in any room in your home. 62"W x 24"L to the pair. NOTE: Photo illustrates a two piece Swag with a Valance. The Valance is sold separately. 1 1/2" rod pocket, 1 1/2" header. Choose from four lengths for your 62-inch wide Glasgow Swags: 24, 38, 54 or 63 inches. Each swag features a 1 �-inch header and a 1 �-inch rod pocket. These swags are cut on the bias for maximum fullness and split in the center for combining with a valance (not included). The 100 percent polyester material is machine-washable. Use a gentle cycle with cold water and tumble dry on low, using a cool iron for touchups. Bottom edge is scalloped and finished with rope cording. Fully lined. 3" rod pocket. Valance is split in center so Inserts may be added to accommodate wider windows. Choose from two lengths (36 or 63 inches) and two colors (coral or aqua) for this 100-inch wide Seaworthy Beach Print swag. 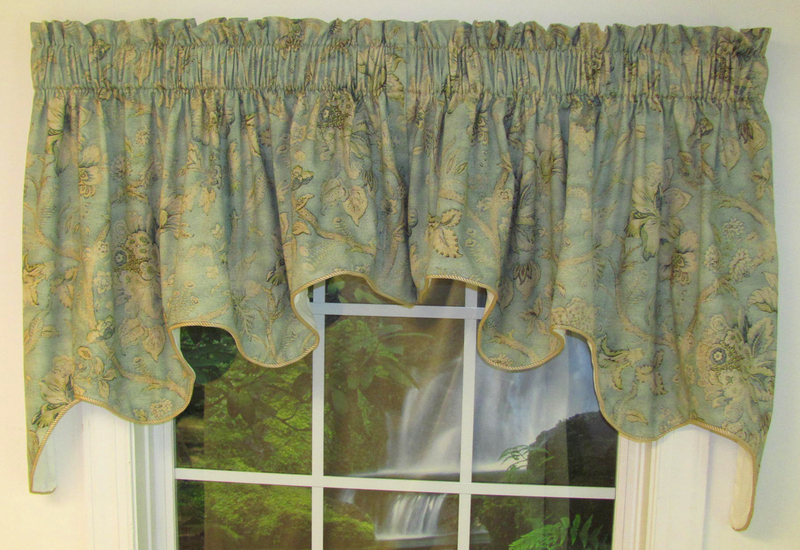 Each valance is fully lined and has a three-inch rod pocket and 2 �-inch header. A 50-inch insert is available for windows wider than 48 inches. Use a 2 �-inch continental rod and allow for a 2:1 or 3:1 ratio of fullness with these American-made coastal d�cor swags. 3" rod pocket, 2" header, fully lined. Fits a standard single window. Enjoy luxurious window treatments for less with this affordably priced Beacon three-piece paisley swag window valance from The Curtain Shop. The total width is 100 inches, and the length is 36 inches at the sides. Choose a lacquer design with more rust red tones or a licorice design with more deep green tones. The licorice design incorporates rust, black and greens. 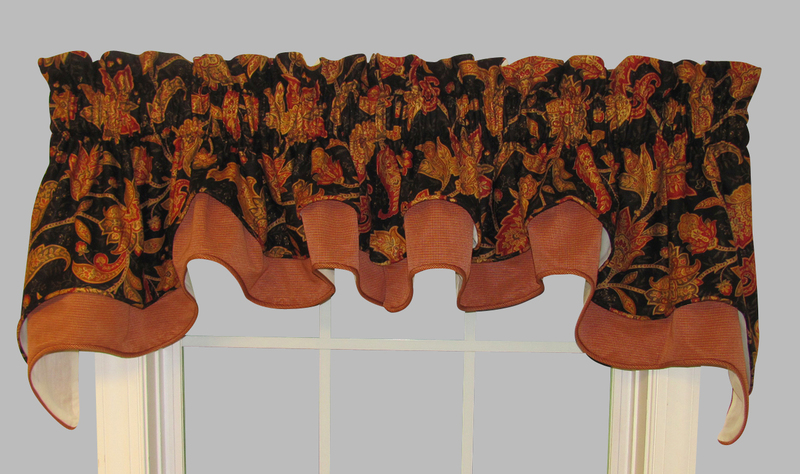 The lacquer design of this U.S.-made paisley swag window valance incorporates red, wine and a deep shade of brown. The 3-inch rod pocket will hold a 2 1/2-inch continental or decorative curtain rod. The 1 1/2-inch header allows for attractive gathering at the top. The bottom edge is corded on each Beacon swag piece. Valance is split in center, 3" rod pocket, 2" header, fully lined. Photo illustrates Carlisle Duchess Valance in Wine. Use Insert valances between the two pieces to accommodate wider windows. Made in the USA. Colburn is a small scale check fabric design. 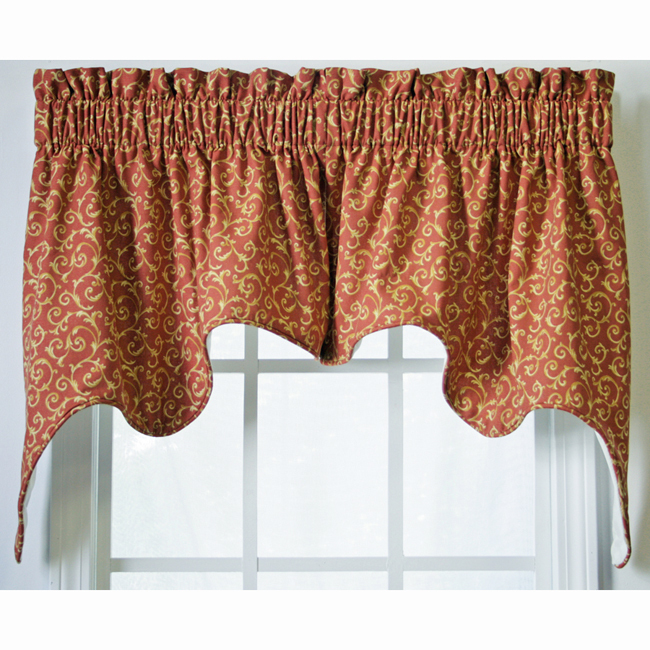 The dramatic Colburn Swag Valance features a 3" rod pocket, 3" header and is fully lined. For a cozy look in any space, choose the Colburn two-piece swag set. The print has a small-scale check design in one of four colors: canyon, geranium and mineral. These 100-inch wide, 36-inch long curtains measure just 17 inches long at the center for a dramatic bordering effect. A 2:1 or 2.5:1 ratio of fullness should be used. A three-inch rod pocket and three-inch header are included. Use with insert valances for wider windows. The Emma's Garden design on this Ellis Curtains Duchess window valance combines blue and mauve tones on green in a beautiful floral pattern set on an ivory background. This fully lined window valance with corded trim from The Curtain Shop is 100 inches wide to accommodate a standard-sized single window. The length at the sides is 30 inches. 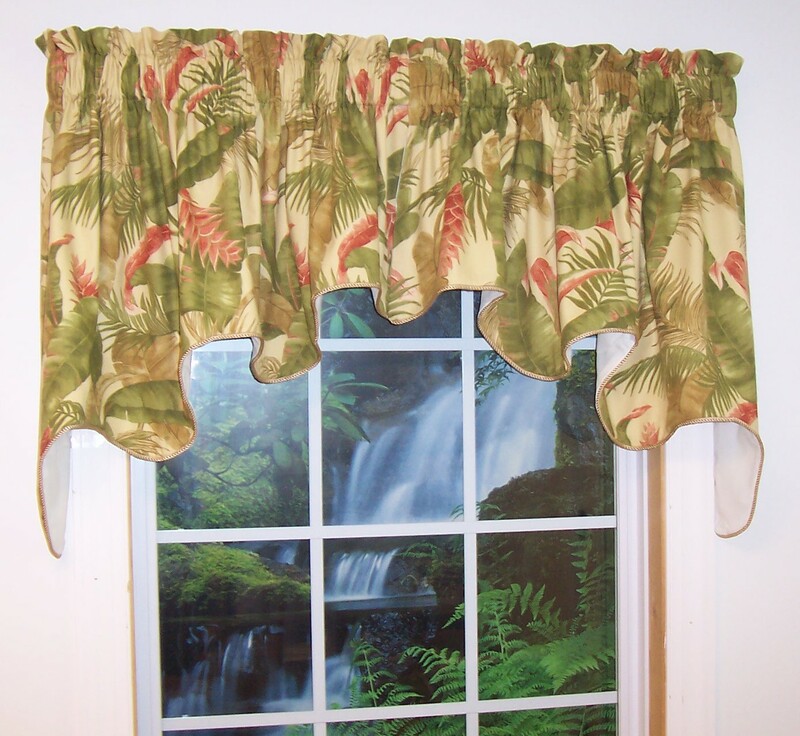 This valance is made with a 3-inch curtain rod pocket and 2-inch header for a soft, ruffled look at the top. A classic, muted Calloway stripe is the pattern on this handsome two-piece Duchess window valance made in the U.S. by Ellis Curtains. Order your Duchess Calloway stripes valance in brown, blue or cinnamon from The Curtain Shop. The 100-inch width on this scalloped valance with coordinating twisted rope cording will beautifully accent a standard-size window. Order a matching insert valance to accommodate larger windows. The length is 15 inches at the center and 30 inches at the sides with a 3-inch curtain rod picket and 2-inch header. It's fully lined and machine washable. Photo shows Duchess Valance in Brown. Melbourne is a traditional woven floral fabric design on a 100% Cotton ground. Dimensions: 100" wide and 36" long. Use a single 2.5" Continental rod for hanging. Fits a standard single window. Use additional Insert Valances to accommodate wider windows. Available in ivory or burgundy, each of these traditional woven floral fabric swags measures 100 inches by 36 inches. These swags are also fully lined with a two-inch header and three-inch rod pocket. 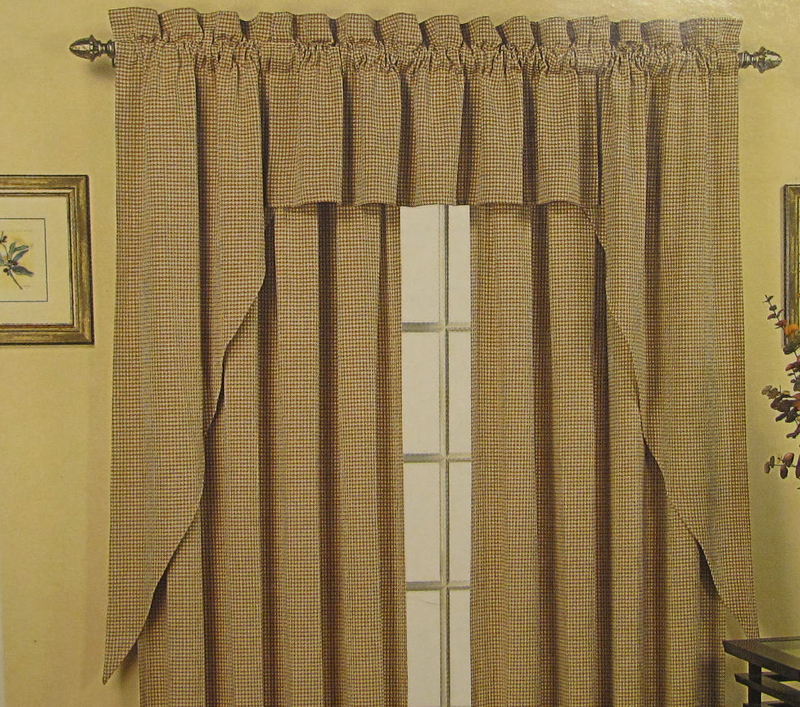 Use a 2 �-inch continental rod to hang (additional insert valances are available for wider windows). Made in the U.S. by Curtains and Home D�cor, these 100 percent cotton swags are machine-washable (gentle cycle on cold, tumble dry on low). We carry these elegant Duchess valances in a Riveria pattern in rich shades of cinnamon, coffee or black at The Curtain Shop. This fully lined two-piece Duchess valance by Ellis Curtains separates at the center to add insert valances for wider windows. The Riviera pattern is created with a vertical leaf and vine pattern. 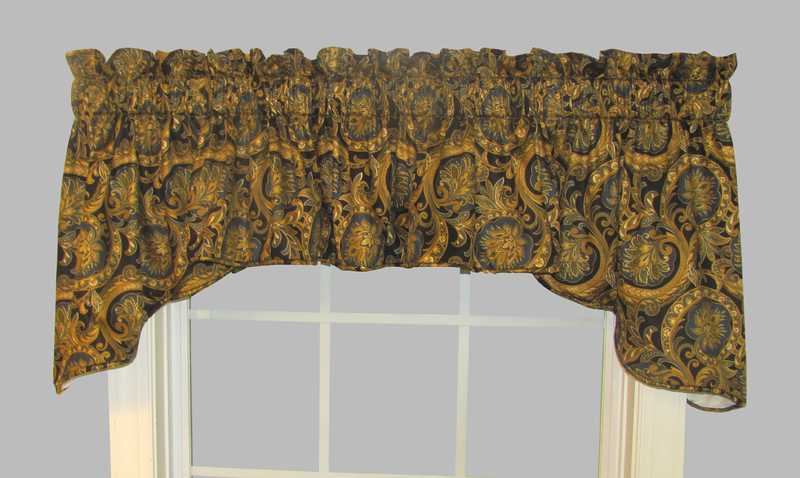 This scalloped valance is 100 inches wide, measuring 15 inches at the center and draping to 30 inches at the side. The cotton/poly valance has a 3-inch rod pocket and 2-inch header. Gently machine wash.
Dimensions: 100" wide and 30" long with sides with a 15" length center. Fully lined, split in center to add Insert Valances to accommodate wider windows. Dimensions: 100"W x 30"L sides x 15"L center. Redefine your windows with our collection of Duchess Jeannette Jacobean-print window valances by Ellis Curtains at The Curtain Shop. Choose yellow accented with black and green or red accented with chocolate. The gently scalloped border is trimmed with coordinating cording. Each of these valances in 100 percent cotton has an off-white lining. The 100-inch width on these 15-inch long two-piece valances with 3-in. curtain rod pockets and 2" headers will fit a standard single window. The split center will allow you to add a Duchess window insert for wider windows. Dimensions: 3" rod pocket and 2" header. Fully lined in a high quality off white lining. Toss pillows and drapery can be "Special Ordered". Call or email us for details. 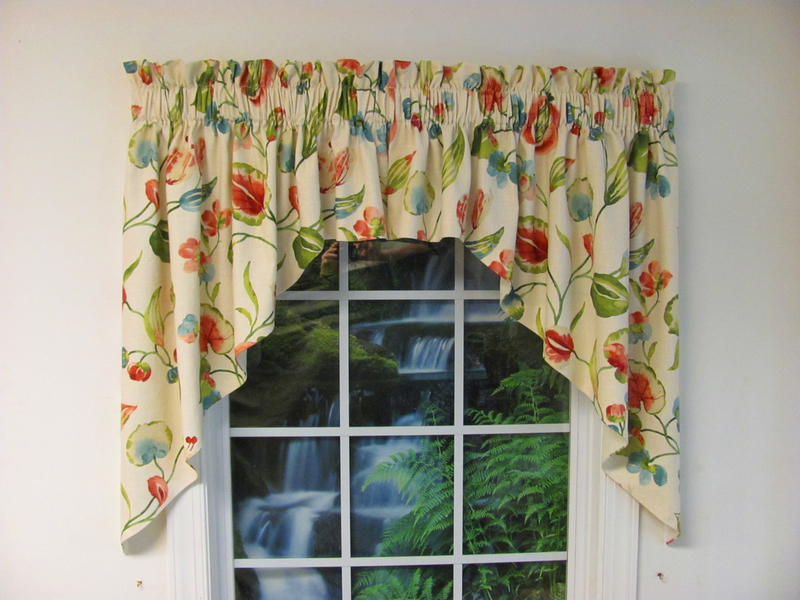 Our customers love the graceful drape of this Duchess Arailia two-piece window valance in a light, multi-color floral pattern by Ellis Curtains. 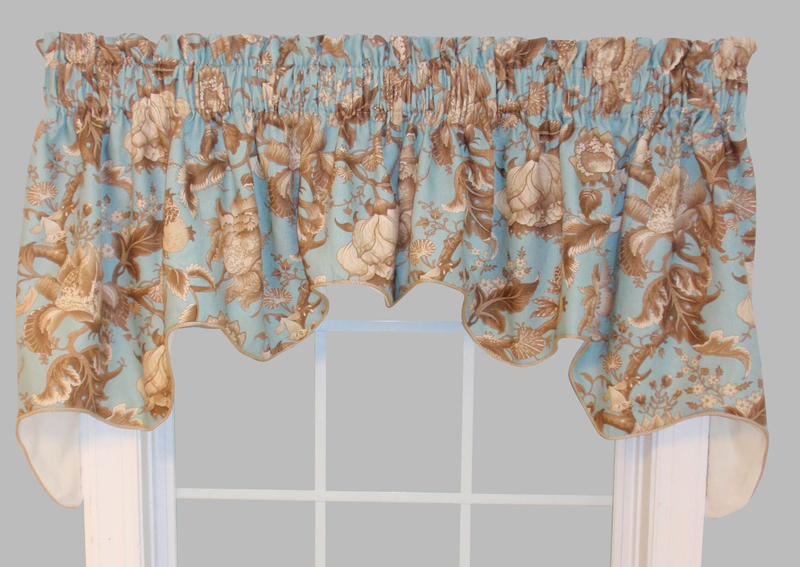 This 100-inch wide fully lined valance can accommodate a standard window. Or, order a matching insert Arailia valance from our Duchess collection at The Curtain Shop to accommodate larger window widths. The length transitions from 15 inches at the center split to 30 inches at the sides on this scalloped, corded window topper. The 3-inch curtain rod pocket can hold a continental rod with a 2.5-inch diameter or 1 3/8" decorative rod. The 2-inch header creates a ruffle above. Made in the USA. LIMITED QUANTITY. 2 pieces split in center. Add additional insert valances to accommodate wider windows. This Duchess Amherst window valance is available in a solid linen, green or burgundy color at The Curtain Shop. 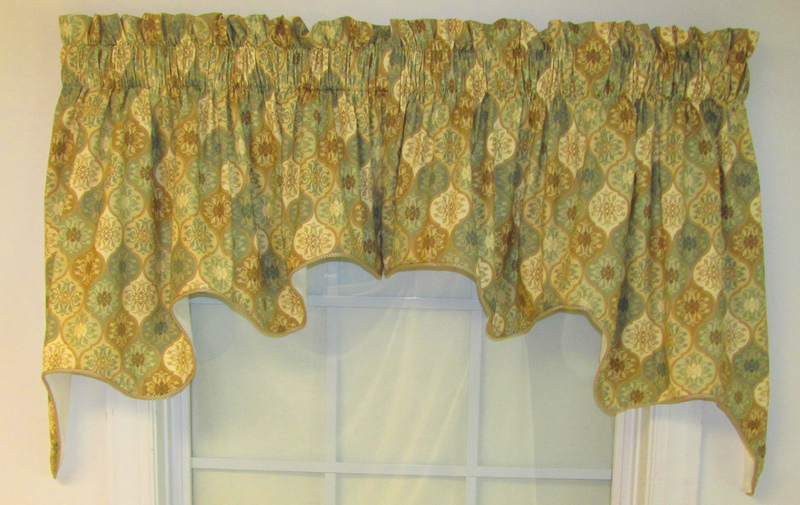 These two-piece valances by Ellis Curtains measure a total 100 inches in width and 30 inches in length. The bottom border is scalloped with twisted rope cording trim. For large windows, place an insert Duchess valance at the center. The construction is 100 percent cotton on these U.S.-made scalloped valances. Brighten any room with seersucker swag window valances from The Curtain Shop. Choose a traditional blue or white color, or select a contemporary kiwi or natural shade. 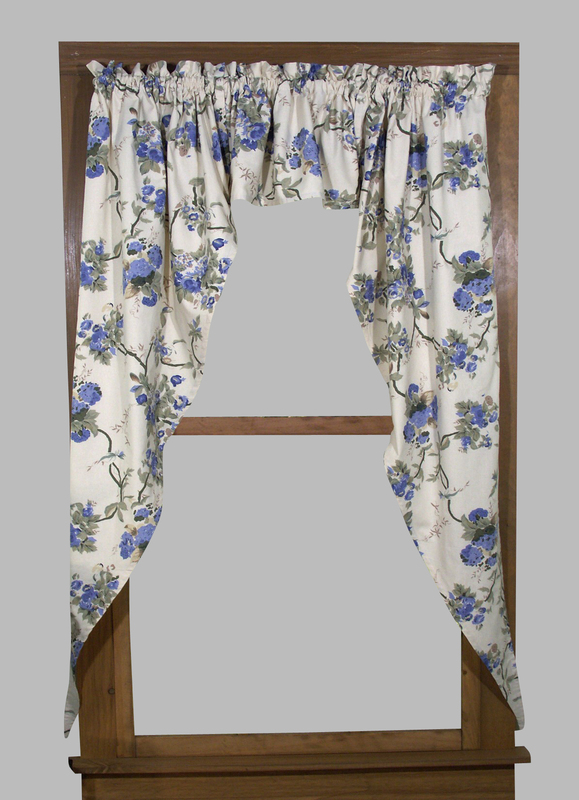 These two-piece cotton seersucker fabric swags are a combined 60 inches wide and 30 inches long to fit a standard single window. The swags are constructed with a 1-inch header and 1-inch curtain rod pocket. For wider windows or a fuller look, our optional matching seersucker valance insert fits at the center split. We also carry seersucker tier curtains and tailored panels. The Mayflower Lined Swag Set is a lightweight polyester cotton blend available in an array of colors. The Mayflower features a 2 3/4 inch rod pocket, 3 inch header, and is fully lined in white. This lovely country style Swag is 135" wide and fits a standard single window; allow for plenty of fullness approximating three to five times the width of your window. The Mayflower Swag measures 17 inches long in center and is offered in lengths of 33, 45, 60, and 81 inches. Overall length does not include the 3 inch header. Insert Valances measuring 45 inches wide by 17 inches long can be used to accommodate wider windows. Dimensions: 100"W x 30"L sides x 13"L center (flat measurement). When you prefer solid colors over elaborate prints, the Imperial Lined Swag is an excellent choice. Available in burgundy, navy, white, and gold, this two piece Swag features a rich, solid color with 30 inch long flowing tapered sides. Measuring 100 inches wide, it features a level 13 inch long split center. Use 50 inch wide Insert Valances between the swag pair to accommodate wider windows. All measurements include the three inch rod pocket, but not the two inch header.includes a three-inch rod pocket. 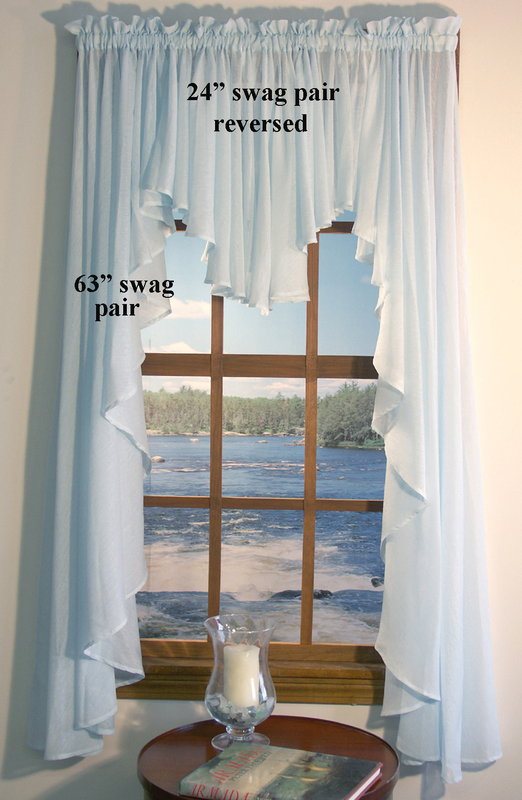 This 100 percent cotton, American-made fully lined swag pair fits a single window up to 45 inches wide. Lining is an off white high quality lining material. For proper fullness you will need two to three times the width of your window. Made in the USA of 100% Cotton. Made in the USA, Floating Leaves Empress two piece Swag measures 70 inches wide by 28 inches long on sides. Center measures 15 inches. 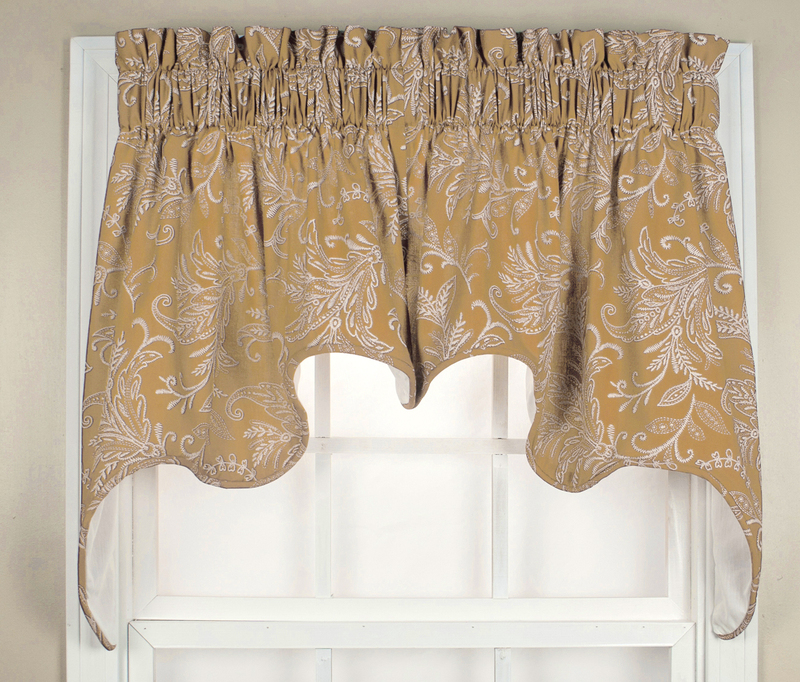 This fully lined swag valance comes in four popular colors, each embellished with Beige etchings of floating leaves and is made of made of 52% Polyester, 48% Cotton, and is machine washable. Features include three inch rod pocket and two inch header. Fits a standard single window and split in center to include the Floating Leaves Scalloped Valance to accommodate wider windows. Allow at least a 2 to 1 ratio of fullness. 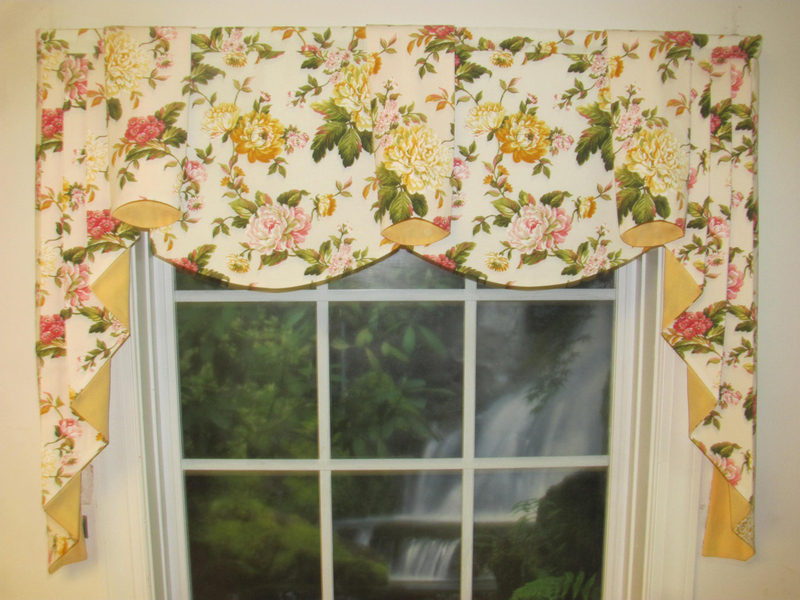 This Floral Lustre Waterfall valance is undeniably eye-catching. The shimmering, textured woven jacquard features a floral motif and a tassel fringe. The valance measures 48 inches wide by 37 inches long and looks beautiful when layered with multiple valances (as pictured). Hang with a 2 �-inch continental rod. Choose from four luxurious colors: cocoa, brick, ivory and sage. 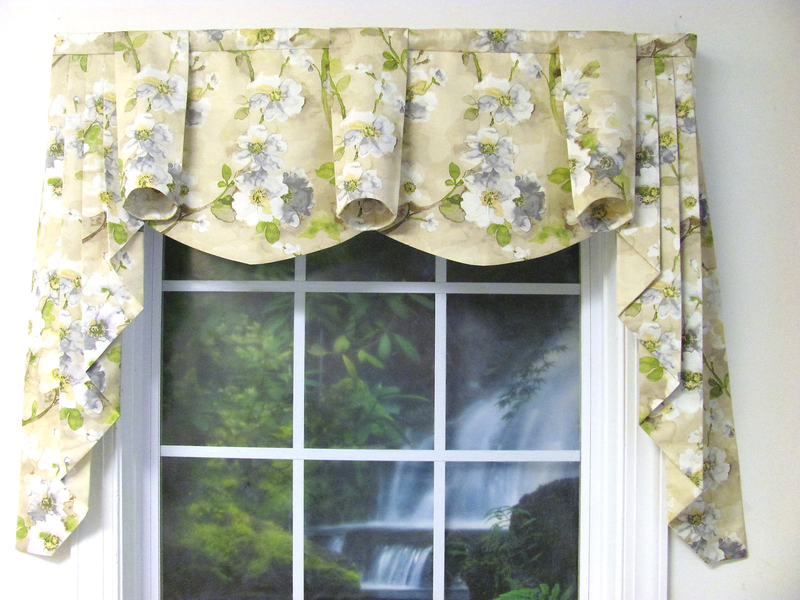 This imported, unlined Floral Waterfall valance is made from 100 percent polyester. Machine wash warm on gentle, line dry and warm iron as needed. With simple lines, the Fleetwood Swag Set looks great in any room. Color combination is Chocolate, Tan, and Light Blue dots . 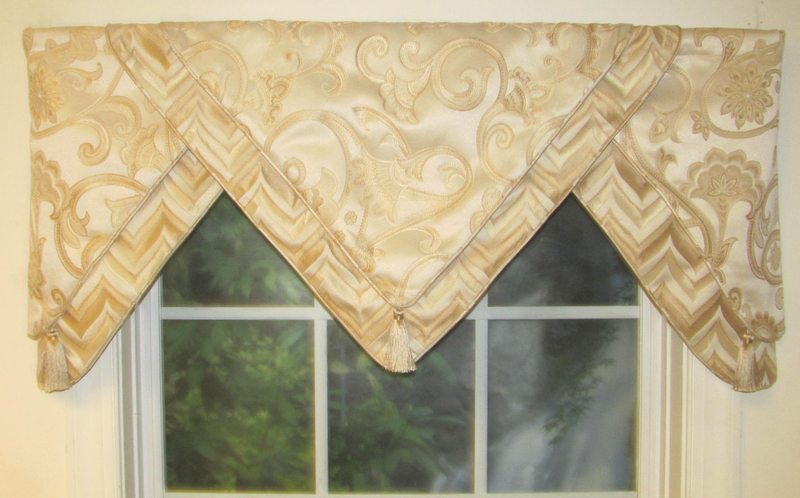 The three piece set measures 102 inches wide and 36 inches long, nd includes one Insert Valance. To accommodate wide windows, add additional Fleetwood Inserts. It has a 3 inch rod pocket and 3 inch header. Made of 53% Rayon, 47% Polyester with white lining material made of 65% Polyester and 35% Cotton. Hand wash in cold water, line dry. Do not dry clean or use bleach. Swag curtains in solids or patterns will dress up your home or office windows with ease. 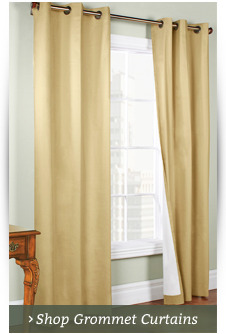 Shop the lowest prices at The Curtain Shop with our famous price-match guarantee. Choose sheers, stripes or solid-colored swags for the kitchen, living room, bathroom or home office. We carry classic, country kitchen and contemporary patterns to match your unique home décor and offer a variety of sizes to suit your windows. Select from dozens of two- and three-piece sets by famous drapery designers. The double Cambridge swag, available in multiple patterns, is a popular choice for more traditional spaces, with its coordinating layers of fully lined fabric with soft scalloped and corded hems. 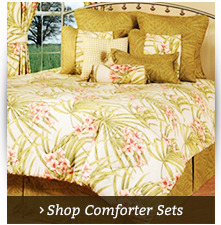 A floral swag curtain tops a handsomely designed layer in sophisticated stripes. Ellis Curtains has created a classic Jacobean floral design on a woven jacquard background for its Imperial Dress collection of fully lined 100 percent cotton swag curtains that are well-suited for formal and European-inspired spaces. For more a neutral look in, solid swag curtains in taupe or beige from The Curtain Shop. Once you've picked your favorite, shop our collection of discounted curtain rods to complement your new swag window treatments. We guarantee your satisfaction with your purchase. If you'd like to see free fabric samples first, just email or call us toll-free at 1-866-886-3632. We've been America's premier choice for chic, affordable curtains for more than 60 years.